The use of virtual instruments is becoming more and more widespread for in-studio sound work but more often it calls upon sampling techniques. 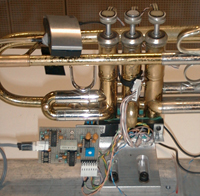 Synthesis through physical instrument models, up to now limited by computer processing capacity, is now beginning to show remarkable acoustic qualities while at the same time creating the possibility of greater flexibility in pitch modification when the issue of control (and therefore of performance) is properly analyzed and interfaced. IRCAM and the company Arturia have created a partnership in the framework of the RIAM project to develop the BRASS software program (trumpet, trombone, saxophone), which will be presented during this session. Participants: Frédéric Brun (director/CEO Arturia) | Xavier Rodet (head researcher, Analysis/Synthesis Team).